Browsing articles tagged with " Penang"
Georgetown, Penang has come a long way since its establishment in 1786 by Captain Francis Light. It was once the regional hub of waterfront commercial and financial district when Kuala Lumpur was still a small outpost. The oldest bank in Malaysia, Standard Chartered Bank opened its doors in 1875 to cater to the financial requirements of early European traders while HSBC, opened its first branch in 1885. However over the decades we saw the decline of Georgetown, prominently starting in the late 90s when Rent Control Act was repealed. Many people moved out of Georgetown to stay in other areas in Penang or Klang Valley for job opportunities. The population declined and Georgetown was even dubbed as “Dead City” when night falls. But, 7th July 2008 was a turning point for Georgetown when it was listed as UNESCO World Heritage City together with Malacca. This month we celebrate the 3rd anniversary and yes, Georgetown is alive again. One of the most noticeable change is Beach Street (locals call it Tho Ko Ke). The restoration of a number heritage buildings adjacent to Standard Chartered Bank was a huge success. If you happened to pass by Beach Street at night, you will fall in love to the city charms when you’re surrounded by these European feel heritage buildings under the dim light. More coffee shops and commercial outlets are entering these restored buildings too. The untapped values of these old buildings are unleashed. Distance away to Weld Quay a whole new landscape is taking place too. The completion ofSwettenham Pier Penang has enabled big cruise such as Queen Mary II to dock in not to mention the restoration taking place at the British Council building. A whole new project – The Rice Miller Development sets to launch too at the Old Clock Tower area. Apparently the plan is set to abide UNESCO Heritage Rules in height limit. 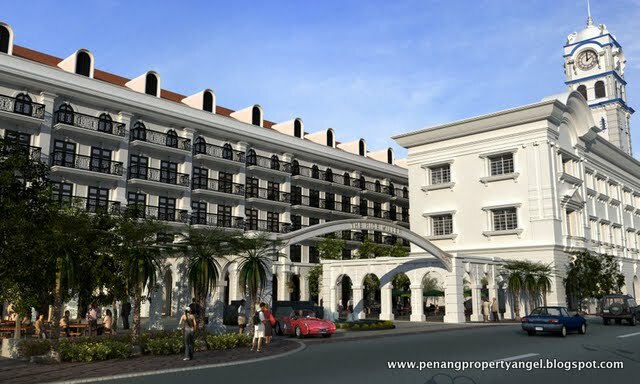 All these private developments will further spur Penang into a truly global city. Don’t compare it with Kuala Lumpur or Singapore because they of different categories. Penang can aspire to be the best secondary city in South East Asia or even Asia. However the progress must be even bolder and faster. Take a look on Singapore, every year new things pop up. Last year it was casino and now it’s the Marina Barrage and Marina Financial District. They are transforming from “Garden City” to “City in a Garden”. Georgetown needs to add more spices so that young people think it’s really cool and stay here for jobs and entertainment. A city, to succeed, needs to have the right positioning. Penang has been doing good over the past 3 years. UNESCO Heritage Status is a bless, and we must preserve the piece of land in inner Georgetown, cherish its rich cultures and histories. As we package and brand it well enough, more tourists will come to Penang and definitely this makes Georgetown a more vibrant, dynamic city.